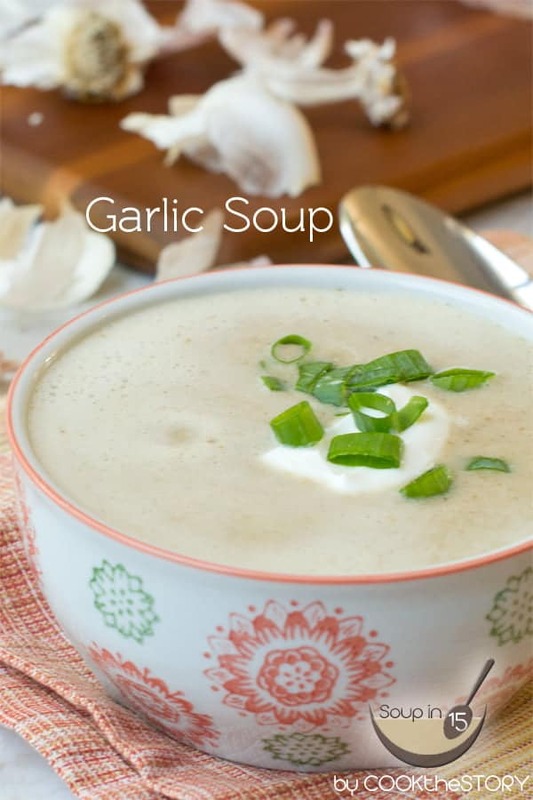 An easy garlic soup recipe that you thicken using bread. It has a smooth rich flavor and will definitely keep the vampires away this Halloween! Halloween is this week and I couldn’t resist making Garlic Soup as my weekly SOUPin15 recipe. It’ll definitely keep the vampires away. Wa ha ha ha ha! If you’ve never had garlic soup before, be afraid. Be very afraid. No, just kidding. It’s not harsh or pungent at all. The garlickyness reminds me of the onionyness of French Onion Soup, mellow and rich. 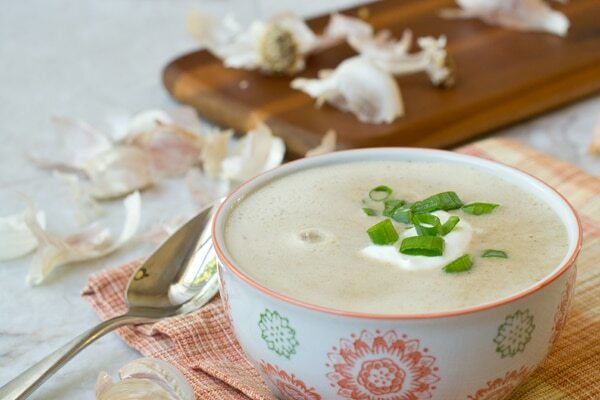 Garlic Soup is popular in the South of France where they traditionally thicken it with bread. The way you do this is to chop up some bread into cubes and then add it to the soup as it’s simmering. The bread soaks up liquid and gets soft and kind of mushy. Then you purée the soup, bread and all, in the blender. The wet bread breaks up completely and spreads through the soup making a creamy texture. Using bread as a thickener is the SouperTip for this soup. It’s what makes it so tasty so quickly. Anytime you’re planning to puree a soup, you can use bread as a thickener. Just cube it up, add it and let it get really wet before blending. This is a great use for stale bread and for fresh or stale crusts that you aren’t planning to eat. Fresh bread works just as well as slightly stale bread does. The first time I made this soup I used whole grain sandwich bread because that’s what I had on hand. I could detect a grainy flavor in the soup that I found wholesome and interesting. The second time I tested it, I used white bread. It didn’t have the grain flavor but was equally good. Feel free to use what you have but know that a more flavorful bread will transfer that flavor to the soup. You can get more of my tips for making quick and easy soups over here. To serve the Garlic Soup, I like to add a scoop of sour cream. It’s not required but adds some extra richness and a tang that go well with the garlic flavor. Sour cream and garlic make a great team! But if you want to have this be a vegan soup recipe, skip the sour cream (or use a dairy-free version. And be sure to use vegetable broth and a vegan bread). In case you don’t know about it, for the past few months I’ve been sharing a new SOUPin15 recipe every week. These are easy soup recipes that are ready, start to finish, in under 15 minutes. 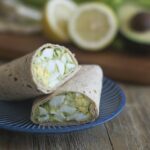 I’ll continue to share these recipes with you every week for a full year. It’s a challenge I’ve set for myself and so far it’s been really fun and I’ve been loving having so many quick soups for our family dinners. I hope you’ve been liking it too. To give you an idea of the other soups I’ve shared, here are two that are ideal for fall weather like we’re having now. Head over and check out the Quick Pumpkin Soup with Bacon and Parmesan Crumbles recipe or the Quick and Easy Potato Soup Recipe. And see all of my SOUPin15 recipes over here. And now, here’s my easy Garlic Soup Recipe. See you in 15! 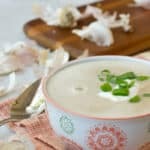 An easy garlic soup recipe that you thicken using bread. It has a smooth rich flavor and will definitely keep the vampires away this Halloween! To get this soup ready in under 15 minutes first read through the recipe. As you read, gather together all ingredients, pots, pans and tools that you will need. That way everything will be at your fingertips when you start. No need to prep any ingredients though. All the prep is in the instructions and contained within the 15 minute time. (For a vegan soup use vegetable broth, a bread that doesn't contain eggs or dairy and skip the sour cream or use a dairy-free version). Yield 8 cups. Serves 6-8 as an appetizer. Measure the broth into a large microwave-safe bowl and put it in the microwave for 7 minutes. Put a large pot or Dutch oven on medium heat with the olive oil. As it heats, peel and roughly chop the onion. Add it to the olive oil and stir. Stir the onion occasionally as you peel the garlic cloves. Arrange all the peeled garlic in a single layer on your cutting board and run a knife through it all several times to roughly chop it. Add it to the onions and cook stirring continuously for 1 minute. Season with the salt and pepper and stop the microwave (if it's still going) and add the heated broth. Stir and cover. Increase heat to high. Chop the bread into 1/2 inch cubes. Add them to the soup and stir. Put the lid back on. Chop the greens of the spring onion. Set aside. Once the soup is simmering and the bread is well-soaked, which it should be by now, transfer soup in batches to a blender and puree until very smooth. Taste and add more salt and pepper if desired. 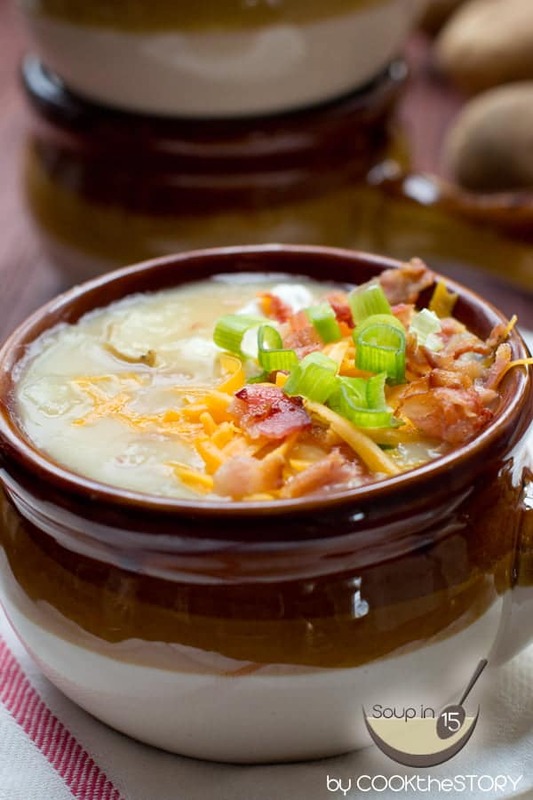 Ladle into bowls and top each with some of the sour cream, if using, and chopped green onions. made soup for first time…roasted garlic cloves and used ciabatta with garlic in it. 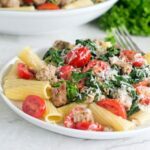 Delish and more flavor with roasting and bread. Nancy, So happy you liked it! Could you skip using bread? Avey, The bread is the thickener for this soup. You could instead get a small bowl and whisk together 1/2 cup water or broth and 2 tablespoons of cornstarch. Stir it into the soup and then bring it to a simmer. That should thicken it. I love this soup. Can you freeze it? Thanks. Gayle, Yes, it can be frozen. Just don’t add the sour cream or green onions before freezing. 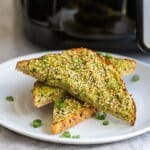 Do you think sourdough bread would work well in this recipe? Yes please!! vampires don’t stand a chance! We are all about soup these days. Looks delish!! 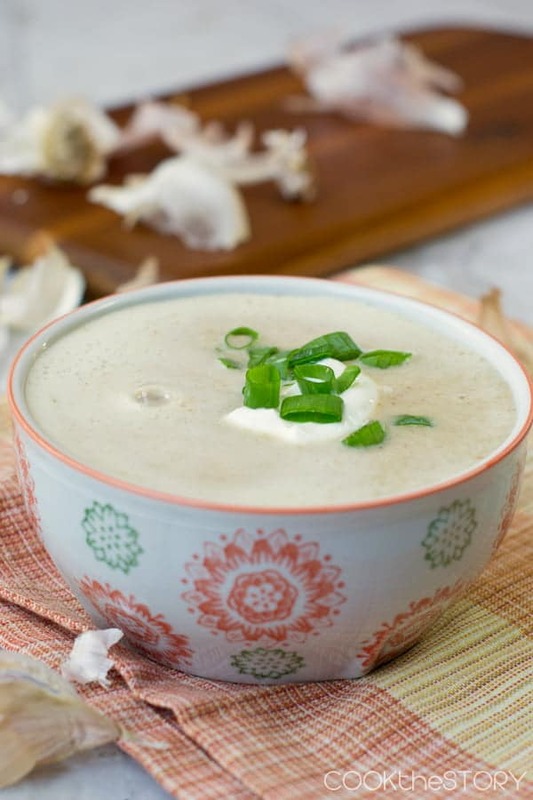 I love your 15 minute soups…and I love garlic! It’s so good for you. I bet this is delicious. I’m making this tonight, can’t wait. I am not afraid! Laughing. I love garlic. Was fascinated that it was thickened by bread. Loved the post.